Machine Guarding Cages. 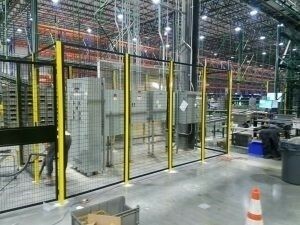 Enclose Machinery and Conveyor hazardous areas with Safety Fence. Complimentary on site Code Compliant layouts. Lowest overall cost. Ships in 72 hours. Proudly Serving NJ since 1909. Stocked in 3 standard heights Not sure if Compliant, We can help. Enclose automated machinery & Conveyors. 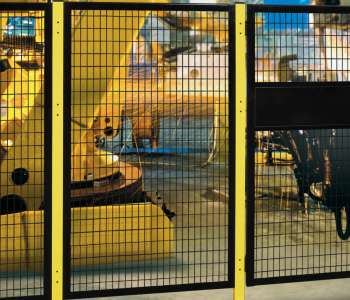 Protect workers with Machine Guard – Safety Fence. 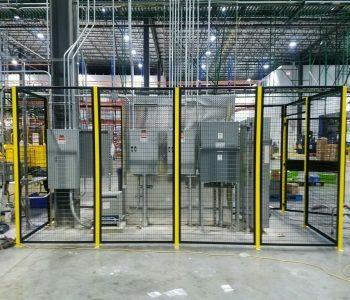 Manufactured with Code Compliant welded wire panels and doors With all welded in either 2” x 2” 8ga or 1-1/2″ x 2-1/2″ grid openings and framed with 1-1/2″ x 1-1/2″ 14Ga steel angle frames. Machine Guarding Powder Coat Posts are 2” x 2” x 14ga with 2” x 6” welded foot plates. 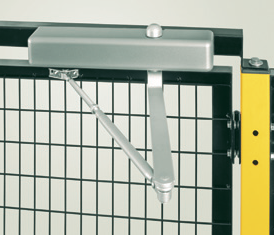 LockersUSA stocks Security Cages in Framed Welded Wire in 8Ga and 10Ga and Woven wire partitions in 10ga. Our Modular design allows for easy assembly of heights up to 20’ high. 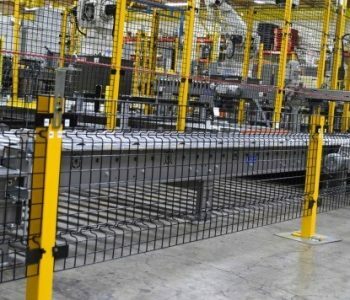 Machine Guarding Safety fence widely used for automated machinery and to enclose equipment. Stocked locally. Free layouts and Quotes. P(917) 701-5795. Conveyor Perimeter Guarding. Conveyor Machine Guarding solutions. Prevent conveyor type injuries to hands, arms, fingers that pull employees into the conveyor. 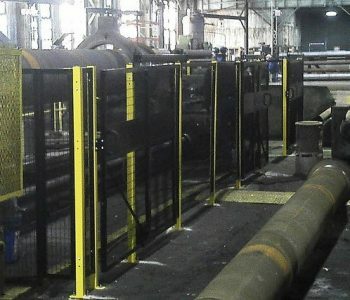 Creating barrier guarding – Creating a safe distance from the point of operation can be achieved with Conveyor Guarding Safety Fence. Our Conveyor Guarding Safety specialists are available onsite for a complimentary safety survey Monday – Friday. 7AM to 5PM. Contact us today for immediate assistance. Sales@LockersUSA.com or P(917) 701-5795. LockersUSA also stocks DEA Pharmaceutical Cages, Access Cages, Data Room Cages, Tenant Storage Lockers, Dispatcher Lockers, Pallet Rack Guarding, Our Install Techs can deliver and install immediately or show your staff how to install. Whichever you prefer. Doors are Stocked in Code Compliant Hinged, Sliding, Bi-Parting double sliding in 5’3”, 5’H, 7’H and 8’ High. Door Locking Options Include. Snap Locks, Cylinder Locks, Cam Locks, Interchangeable Cores, Standard Handle, Push button and Interlocks. 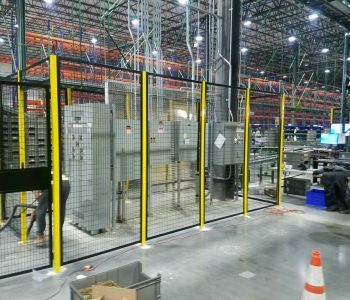 Machine Guarding Cages, Conveyor Perimeter Guarding Cages NJ, Machine Guarding Safety Cages, Safety Cages, Safety Fence, Lathe machine guarding cages, fertilizer safety cages, machine guarding cages delivered daily to Newark, Linden, Elizabeth, Edison, Perth Amboy, Union Twp, Paterson, New Jersey, NJ.